An underwater fishing camera is a device so anglers can view live footages of the fishes underwater which comes in handy during fishing. In other words, anglers use the fishing camera to fish more effectively as you can detect the exact location on the fish especially at the bottom of the sea. This device is mostly used during open water fishing in river, lakes and the ocean or ice fishing. Apart from that, you are able to enjoy the underwater view and discover different type of species of fish and other aquatic creatures. An underwater fishing camera varies from a fish finder as fish finders are used to find the best areas for fishing. An underwater fishing camera consist of a screen and the camera itself connected by a cable. The screen is usually between 3.5 inches and 8 inches in length. Besides that, the factors that determines the best fishing camera are the display screen in which larger screens are better for viewing images, LED lights which help you see the fish at night and in unclear waters as well as the design and overall camera quality. Check out the best underwater fishing camera review below. Did you know that there’s a way to prevent the light from tricking your eyes as you look into the water? Polarized fishing sunglasses which is actually an enhanced color vision pair of sunglasses can help increase clarity of your eyesight as you wear them. Fishing lines like fluorocarbon lines can actually turn or look invisible under water so if you don’t have a sharp eyesight, you might lose your fish. Resolution is basically the number of pixels on the LCD monitor. The sharpness and clarity of you image is determined by both the resolution and size of your monitor. The higher the resolution, the clearer the image displayed on your LCD monitor. Pictures with high clarity is important so that you can know the exact and detailed location of the fishes when you are fishing hence you are able to fish effectively with an increased chance of catching the fish you desire. The screen size is actually based on your preference. Larger LCD monitor size gives you a better viewing of the pictures displayed underwater as it can capture more details of the underwater surrounding and pictures. Also, larger monitors give you higher resolution as more number of pixels are being spread out over a larger area. However, larger LCD monitor sizes are not portable so it is tedious to carry it around with you when you travel. Most of the common lights used as the camera light source area LED white lights and infrared lights. Lighting is essential to assist you in fishing during low light conditions. Also, underwater fishing camera doesn’t work well if the water is not clear or murky. So with good lighting, your camera is able to display a clear picture of the fishes underwater when fishing. Anysun’s underwater fishing camera is suitable for all water-related activities such as exploring underwater, monitoring aquaculture, fishing in lakes or oceans and for underwater salvage. You can view the live footage underwater at all of these areas and the footage and images will be displayed on the display screen. It comes with a camera extension cable of length 20 meters. In other words, the waterproof camera will be tied to the cable and sink downwards to the bottom with a depth of 20 meters. One end of the cable is connected to the camera while the other end is connected to the LCD monitor to display the images. Moreover, this product is equipped with a remote control on top so you are able to control manually and maneuver the direction of the device underwater according to your preference. Also, this product operates on a 12V 4000mA lithium battery which holds up for a continuous time of 10 hours upon use. The camera on the other hand is waterproof so it can be submerged underwater. It also is cold-resistant and anti-corrosive hence improving its durability and is able to last for a long period of time. The 20 meter cable is a pull-resistant cable in which it is least likely to break and snap upon pulling in and out of the water frequently. Apart from that, this device is equipped with a 7 inch TFT color monitor with sun-visor to provide a brighter environment when fishing. Also, this product comes with 14 high power white light as the main source of the camera light. Both the combination of the color monitor and the white light brightens up the picture of the view underwater which comes in handy during night or when fishing in unclear water. The pictures and videos recorded are HD with high clarity and high resolution images displayed on the screen. Also, this camera gives a 360 degrees view as in it can rotate fully automatically to give you a full view at any angles according to your preference. 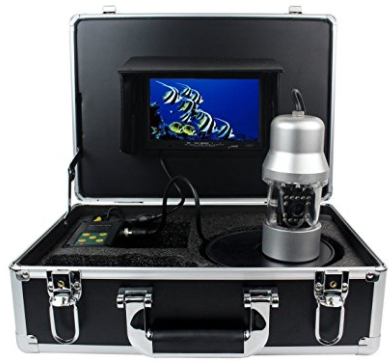 This underwater fishing camera consists of a 7 inch widescreen flat panel monitor which displays high resolution images of the view underwater. The images displayed are with resolution of 800 x 480 Pixels hence you are able to view in-detail images of the underwater world and determine the exact location of your fish. Apart from that, this product includes a 50 feet camera cable, sun shield, soft pack shuttle, 3-stage battery charger, down-view/stabilizer fin as well as a 7A rechargeable battery upon purchase it. The camera cable connects the camera and the image displayed on the monitor will be showing the live footage of the depth 50 feet. The image displayed on the monitor is clear and crisp. For your display monitor, you can choose either to display the image with color or B&W LCD. In other words, you can switch from color and LCD video out and vice versa. The camera on the other hand is only able to view the downward image of the horizontal plane. You need to modify it if you want it you also capture the upward image. Besides that, it can be hooked onto your TV, all you have to do is connect an AV cable from the AV out port of your monitor to your TV. Not only that, this fishing device comes with an 1/3 inch image sensor to detect and send the location of your fish and the images captured to your display screen. Also, this product comes with LED lights especially to help you fish during low light conditions and also comes in handy when you are fishing in murky water. This underwater fishing camera operates on 12V DC lithium battery as power supply and runs up to 7 continuous hours of usage when fully charged. The red light on the battery charger indicates that the battery is being charged meanwhile the green light indicates that the battery is fully charged. Apart from that, the images displayed on the monitor screen are of a high resolution of 800 x 480 Pixels. The camera is able to display images of high clarity for water depth of less than 30 meters as it would get a little blurry over the depth of 30 meters. Moreover, it works optimally at temperature of -20 degrees to 60 degrees. The water must be clear and not cloudy for it to work properly to give you the picture view with maximum clarity. The camera on the other hand is adjustable so you can move it either to the left, right, up or down and it is also able to display images from 100 degrees angle wide so you can get a better viewing angle of the fishes below. However, the camera is lightweight and floats on the surface of water so you have to clip weights on it to make it sink so it is able to capture the live footage of the fishes at the bottom of the river or sea, around 30 meters at maximum. This product is equipped with a large 7 inch TFT LCD monitor. Despite not being so portable, the large LCD monitor gives you a better viewing and higher resolution images displayed from underwater. The monitor screen and the fishing camera are connected using a 30 meter cable in which the camera will be submerged underwater to capture the view. Also, this product comes with 12 white LED lights as a light source which are adjustable according to your preference for a better view during low light conditions or in unclear water conditions. Aqua-Vu’s underwater fishing camera is small and portable, with a size similar to that of a smartphone. Therefore, you can easily fit it in your pocket or even a small travelling bag. However, the smaller the screen, the smaller the viewing picture displayed so you might miss out on a few details when fishing. Besides that, this product is equipped with a 3.5 inch LCD screen and a full color micro camera which offers pictures and footages of the underwater life with amazing color and clarity however the water in which you are fishing should be clear to get the display picture with maximum clarity. This fishing camera comes with a 50 feet long cable that connects your LCD screen monitor and underwater fishing camera. Hence, your camera can take pictures at depth of 50 feet maximum. Deeper than that, it will display blurry images. Also, it doesn’t have the video recording feature. Moreover, this product includes an integrated cable management system as well as fin and clip system ideal for both open water fishing and ice fishing. The fins function to position the camera in the moving water when there is heavy current. This product also has a viewing angle of 135 degrees field of view so you can get a better view of the fishes underwater when fishing. Furthermore, this device includes a battery, USB and wall charger upon the purchase of this product. The battery on the other hand is a rechargeable internal lithium ion battery and can operate for a period of 6 hours continuously. However, it is always good to bring spare batteries if you plan on fishing more long hours. This product also comes with auto infrared lights. This is important to give you good lighting especially during the night or when the water you are fishing at is murky for instance. However, these infrared lights doesn’t work well under direct sunlight. Eyoyo’s underwater fishing device is equipped with a 4.3 inch monitor, camera with cable, instructional manual, a charger as well as a set of metal clip. The sun-visor monitor has a built-in sunshield in which prevents the glare of sunlight when fishing during daylight or under direct sunlight so you view the image displayed well and easily. The monitor is also small and portable with a picture quality resolution of 960 x 240 pixels. Also, the camera captures the images of the fishes and life underwater at an angle of 130 degrees in which you can adjust to view your preferred location in that angle range. Apart from that, the product is waterproof as well as cold-resistant hence contributing to its durability. It can operate well under temperature ranging between -20 degrees to 60 degrees. The extension cable on the other hand is 15 meter long and pull-resistant so that you can use it anytime frequently without it snapping from frequent use. Moreover, this product runs on 2600MA lithium battery and has a runtime continuous battery usage of up to 7 hours however, it is good to bring spare batteries along. Also, there are 8 pieces of infrared LEDs as a source of LED light in which you can adjust according to your preference to light your surroundings up especially during low light conditions. The 4.3 inch TFT color monitor of this fishing device is small and lightweight hence being portable and easy to carry around when fishing. However, the picture displayed on the screen will be small too. In a nutshell, an underwater fishing camera is important to get a live footage of the life underwater hence knowing the exact location of the fish you plan to catch when fishing. You should look through factors such as lighting, screen size as well as resolution when choosing the best underwater fishing camera. Therefore, I hope my review assists you in making your decision. Fish finders also work the same but instead of live footages, they detect waveforms and pulses of sound energy which will be displayed on the screen.